We are fortunate that many of our patients are from diverse and mixed ethnic backgrounds. Our providers have acquired ample experience providing dermatological care to individuals of various skin types at some of Philadelphia’s main metropolitan hospitals, including Thomas Jefferson University Hospital and Pennsylvania Hospital. Treatment for darker skin types, such as African American, Latino, Indian, Asian, Native American, and other ethnic skin types, must be carefully approached. This is because darker skin is more sensitive to skin inflammation, such as that caused by acne breakouts, which leads to unsightly discoloration. Our practice has invested in technology that is either “color blind” or specifically suited for dark skin pigment to provide safe and effective medical and cosmetic treatments for darker skin types. Specifically, we provide peels that correct dark discoloration, remove dark “moles” (dermatosis papulose nigra), treat keloids with unique Cryoshape technology, and more. We invested in lasers and technology specifically for the treatment of African American, Latino, Indian and mixed ethnic patients . Treatment for acne scars in dark skin types requires special considerations to avoid treatments that may cause excessive lightening or darkening of the skin. 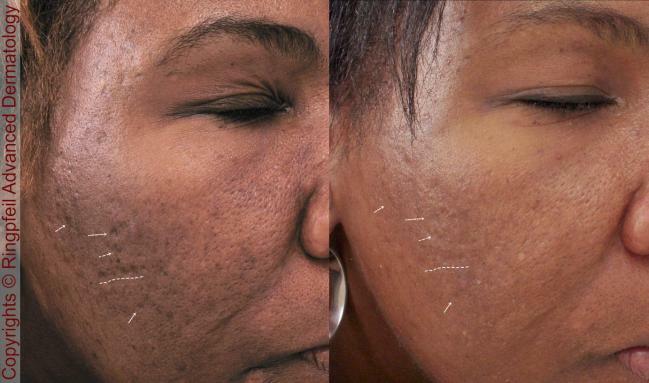 Fortunately, we now offer the Infini Microneedling RF device, which, in combination with the Picosure laser, has given us the best improvement in dark skin acne scars to date. Treating dark skin requires experience and special considerations. Keloids are a genetic condition more common among African American and Mediterranean individuals. 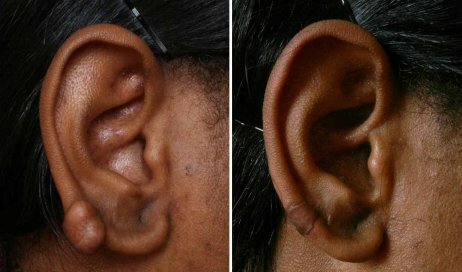 We have developed unique treatment protocols that remove keloids permanently. However, expectations need to be set properly, as there are many cases in which keloids are extremely challenging to treat. Book a medical consultation to find out the best way to remove your keloids. 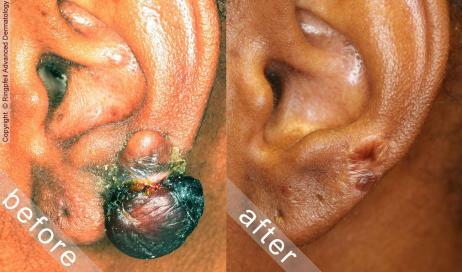 For more information about keloid treatment, visit our keloids page. Acne is not unique to individuals of mixed ethnic background. However, darker skin reacts differently to the inflammation that acne inflicts on the skin. Those with dark skin who had difficulty managing their breakouts often find themselves dealing with hyperpigmentation (dark patches) on the skin. In some individuals, these dark marks can cover the majority of the facial skin. To avoid hyperpigmentation, it is important to control acne inflammation as early as possible. Avoiding irritating topical medication can also help to control the inflammation. additionally, it is important to avoid irritating topical medications. Dark skin is more sensitive to inflammation and has higher risk of discoloration. Many of our African American and Indian patients are surprised when they find out that there is an effective and safe laser hair removal for their skin type. We carry the Candela Gentle Yag laser which is the gold standard for removal of hair in skin type IV and V. Unlike diode lasers that carry higher risk of pigmentation issues, the NDYag laser is safer and remove the hair in fewer treatments. Dermatosis papulosa nigra is a genetic condition of benign “moles” that are small, dark, and elevated. They are usually seen along the cheeks, eyelids, and neck. These lesions can be removed for cosmetic reasons by one of our dermatologists. The procedure, called curettage, involves gently scraping the lesions off of the skin. Effects can be enhanced by pre-treatment with a topical retinoid. The procedure does not prevent new lesions from forming and is not covered by insurance.